Posts about the Tour de France. I was reading the news this morning when I saw that Rasmussen’s team, Rabobank, had kicked him out of the tour. “Michael Rasmussen has been sent home for violating (the team’s) internal rules,” Rabobank spokesman Jacob Bergsma told The Associated Press by phone. The team also suspended him. Only once before in the 104-year-old Tour has the race leader been expelled. In 1978, Belgian rider Michel Pollentier, trying to evade doping controls after winning a stage at the Alpe d’Huez in the Alps, was caught with an intricate tube-and-container system that contained urine that was not his, said Tour historian Jean-Paul Brouchon. Another Tour de France rider  Italian Cristian Moreni  failed a doping test and was led away by police at the end of Wednesday’s 16th stage. Moreni tested positive for testosterone after stage 11 of the Tour last Thursday, said Didier Simon, of cycling’s world governing body, the UCI. He said it was for Cofidis to decide whether to pull its other riders from the Tour in the wake of Moreni’s failed test. I was surfing last night and came across this blog post by a chemical engineer talking about the Floyd Landis Tour de France Positive Doping Test. I think it was very interesting and wanted to share it with everyone else. I was surfing yesterday and came across this link to an NPR show called On Point. On Monday, their show dealt with Testosterone. If you want to listen, follow this link to the On Point — On Testosterone show. I’m listening to it right now…as of minute 20, it is a fairly good and balanced show. [Update 2012-12-26 16:57:30] On Point changed their website. I’ve updated the show link. [Update 2013-01-18 06:58:05] Lance has admitted to doping. [Update 2013-01-18 07:12:02] I’ve decided to download and archive what media I can. Here is a direct link to the mp3 just in case the on point website goes down. I got up to get ready for a ride. When I turned off my alarm, it sounded like they were talking about Floyid Landis on the radio. I turned on CNN Headline News. They are reporting that Lansis' B test came back positive. I didn't find any references on the web yet; however, when I get back from my ride…I'll link to a few. In the meantime, try this Google News search for Floyd Landis. I just wanted to let everyone know that Floyd Landis’ B Sample is scheduled to be tested Saturday (5 Aug). We’ll see how it comes out. I’m rooting for a negative test (or one that can be explained naturally). We’ll see. I rooted for FLoyd from when I found out he had his dead hip…. [Update 2013-01-18 06:48:27] As we all know, that sample came out positive. The Tour de France has been an incredible race to wach this year. On Wednesday, American Floyd Landis was in the yellow jersey for the 2nd day in the alps. He had a rough day and lost 10 minutes…he was OUT of contention! Thursday was the 3rd and final day in the Alps, the last mountain stage before Paris. Floyd got away from the pack, getting back more than 8 minutes and taking the stage win in an impressive effort!! And just a few minutes ago (Saturday), Floyd regained the yellow jersey with an outstanding performance in the final individual time trial. 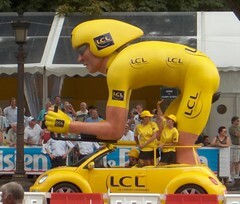 For the 8th consecutive year, an American will ride along the Champs-Elysees in yellow! For those of you not into cycling, you've missed a phenomenal Tour. And as impressive as the stats are for many of the riders, it is the sportsmanship, especially among the leaders, that stands out. It's great to see a hard-fought contest in a year when cycling has experienced a great deal of controversy and turmoil. Little One and I have enjoyed the excitement of the last 19 days of racing, and I know tomorrow will be an outstanding final day of the Tour! Go Floyd!! There are just seven riders left in the Discovery Channel team. Benjamin Noval is the latest to quit the Tour; joining team-mate Paolo Savoldelli who stepped off at the 43km mark. The Discovery Channel team has lost the services of the two-time Giro d’Italia champion, Paolo Savoldelli. The Italian abandoned at the 43km mark of today’s stage. This is Amazing! Who would have ever thought this! I wonder what Lance is thinking of his former teammates. One thing that his team always prided itself on was taking everyone to Paris. Now two riders have given up. I just got done watching OLNs live coverage of the 2006 Tour de France. There were two wrecks (I saw one and missed the other) where guys broke collar bones. The second appeared to be caused when one or more riders in the peleton twitched and was hit by others. At the end of today's stage Matthias Kessler sprinted out and ended up and won the stage. I was rooting for him the whole way to the line. For those who don't know, in yesterday's tour, Kessler got out in front, put in a good effort, but got caught by the peleton. I was bummed….he put out a good effort and didn't get the stage win. OLN mentioned that Kessler later said he felt robbed. I would to.